A tight budget and short timeline inspired an innovative concrete and terra cotta facade. BNIM and Moore Ruble Yudell approached the design of the Henry W. Bloch Executive Hall for Entrepreneurship and Innovation at the University of Missouri-Kansas City with two objectives. The first was to express the creative spirit of the university’s program in entrepreneurship, which at that point lacked dedicated support spaces. The second goal was to tie the contemporary structure to its historic surroundings. 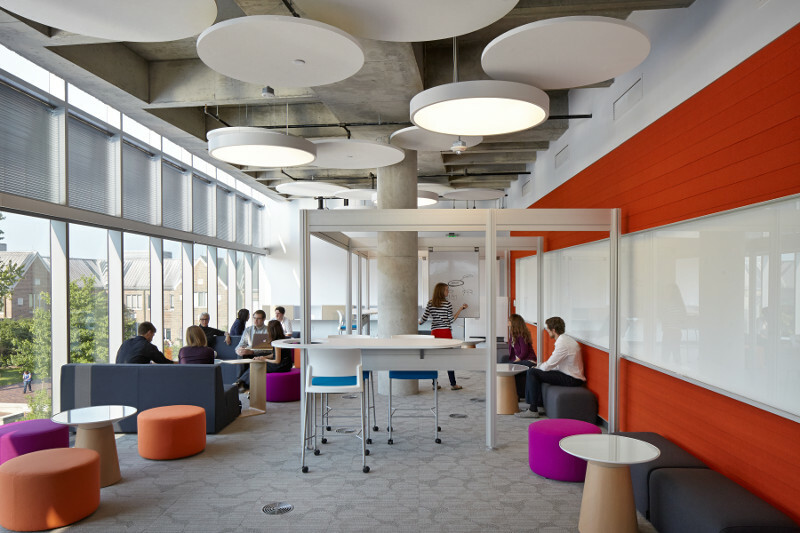 Moore Ruble Yudell, who developed many of the project’s interior concepts, tackled the former, creating flexible classroom and laboratory spaces and a multi-story amphitheater that doubles as casual seating and a venue for school-wide gatherings. As for the latter, BNIM designed a multicolored terra cotta envelope that balances singularity with connection. “The idea was to create a building that sat by itself, but somehow bring it into context in terms of materials,” explained BNIM senior project architect Greg Sheldon. To further streamline construction, BNIM and Moore Ruble Yudell decided to integrate the concrete into the interior aesthetic, so that the inside face of the panels required no additional finishing beyond sandblasting. General contractors JE Dunn Construction “loved that if we could pull this off, the insulation’s in place and the inside’s finished,” said Sheldon. “They bring it out, put it on the building, and that’s it.” For glazing, the design-build team ordered a YCW 750 XT high performance curtain wall from YKK, sized to slot into the opening between the building’s masonry components. 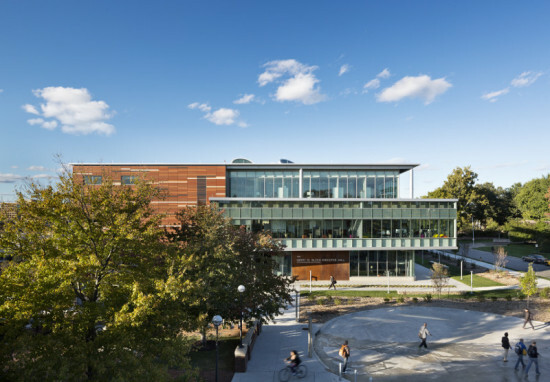 Together, the insulated concrete-terra cotta panels and high performance glass helped put the building on track to earn LEED Gold certification. The patterns in the terra cotta “weren’t accidental, but were studied and studied,” said Sheldon. The south end of the building is a deep red, like the adjacent Bloch School Building. 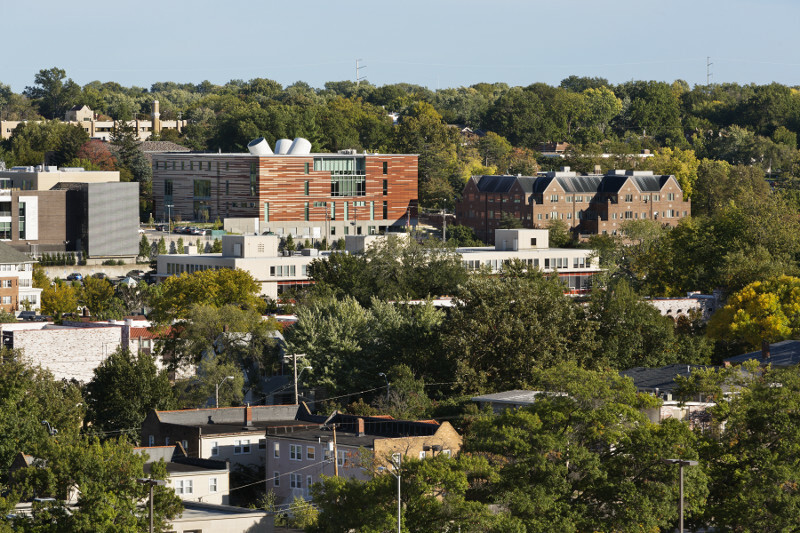 To the north, the colors fade to a buff yellow, reflecting the lighter tones of the nearby student center. To perfect the patterning, the designers first looked at the range of colors available through NBK and chose the six most compatible with the surrounding buildings. They then unfolded the elevation of the building and plugged the different shades into their digital model. BNIM experimented with different combinations, printing each and pinning it to the wall before making adjustments. “I don’t know how many iterations they did,” said Sheldon. “It just went on and on.” The final scheme achieves the desired effect. In color and materials, it creates a dialogue with the older buildings around it. Yet the bold patterning simultaneously marks the facade as a 21st century creation. Upon receiving the $32 million gift from Henry W. Bloch that made building the new Bloch Hall possible, then-Dean Teng-Kee Tan observed that “the path of innovation is never a straight line.” The architects manifested the analogy in the building’s architecture and landscaping, carving the interior into a series of curvilinear spaces, and connecting the building to its neighbors via a meandering path. 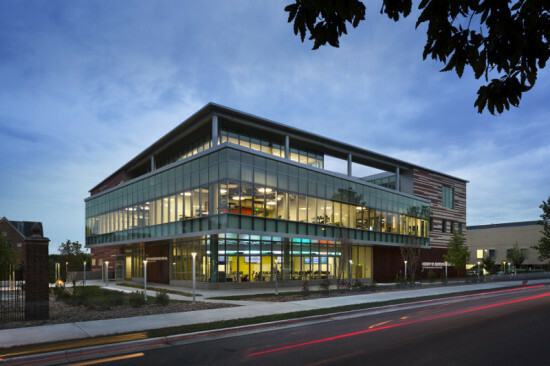 But the statement applies equally to the design process itself, in which a tight budget and 14-month construction timeline encouraged an innovative combination of concrete, terra cotta, and high performance glass. A successful sublimation of limitations into opportunity, the story of Bloch Hall’s envelope is the story of entrepreneurship in microcosm.